Heh heh…”Darling Tab.” I haven’t had Tab since I was a little kid (back when TV only had three channels) – I’ll have to pick up a six soon and give it another try. I look forward to a Diet Pepsi / Tab smackdown. My favorite diet cola is Coke Vanilla Zero, followed by Coke Zero and Diet Pepsi. 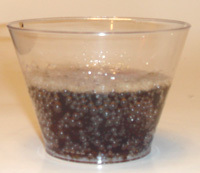 Diet Coke tastes like industrial waste. Diet Rite comes in a number of unusual flavors, including Tangerine, which is easily the best diet orange(ish) soda made. I’m kind of surprised you found it, because it’s mostly found in the South. Having the regular Diet Rite when it’s not flat makes a big difference. I’m in the south (NC) and can tell you that the bottle of Diet Rite you had is ancient, they changed their packaging at least a couple of years ago, if not longer. No wonder it wasn’t any good! I love the stuff, it’s one of the few diet drinks out there without caffeine and aspartame. They also make raspberry, tangerine, and white grape (which is wonderful) in addition to the cola. TAB would clearly be the winner…in my book it even wins agains Diet Coke by a long shot (Diet Coke tastes NOTHING like Coke, it’s too sweet). TAB, with a tiny dash of lime juice, actually comes pretty close to Coke Classic. Little known fact: TAB stands for Totally Artificial Beverage. TaB was the original ‘Diet Coke.’ Most of the time I could get TaB at any fountain that was selling Coke products way back in the 80’s. Then along came diet Coke and TaB started to fade away. Then aspartame came along and TaB was ruined for me. I switched to diet Coke but then gave that up because of the aspartame aftertaste. 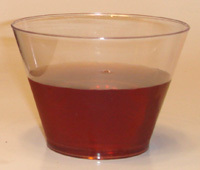 I loved TaB because it was spicier than most sodas and not as over-sweetened. Unfortunately the nasty aspartame taste completely over-powered the goodness that was TaB. I tried the energy drink version when it came out but it was watermelon flavored and not good at all. Wow! That Diet Rite looks horrible. Was it left out in the sun for months? I loved Tab in the bottles as a kid and even into adulthood I would get a six-pack now and then. I stopped loving it when they switched from saccharin to aspartame (nutra-sweet). I wish they’d bring back that old formulation. 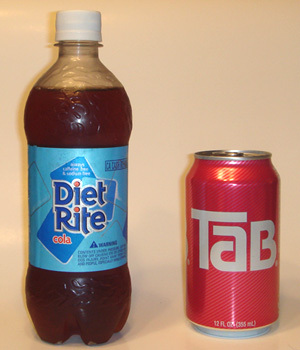 Around here,12 packs of TaB are in large supply,and so are 2 liter bottles and 12 packs of Diet Rite. Never tried either,and snackgirl is right. Unless you look for a Dr.Pepper/7UP machine(which are found at a gas station in north Fargo and my local Wal-Mart.) there’s no chance of finding Diet Rite in a pop machine. Even the pop machine at Wal-Mart doesn’t have Diet Rite. That being said, Diet Mtn.Dew is literally the only diet soda I actually care about.